The brightest mystery spots on the dwarf planet Ceres lie in Occator Crater, seen here in an image captured by NASA’s Dawn spacecraft. With or without 3D glasses, a newly released video tour of Ceres offers a new perspective on the dwarf planet's dramatic and diverse surface. The new Ceres video tour, which was compiled from images gathered by NASA's orbiting Dawn spacecraft, scopes out the mysterious bright spots at the bottom of the dwarf planet's 2-mile-deep (3.2 kilometers) Occator crater and a 4-mile-high (6.4 km) mountain scientists are calling "The Pyramid." The Pyramid also has unusual bright streaks running down one side, which are not yet understood. Its 4-mile height is a revision from researchers' previous estimate of 3 miles (4.8 km). 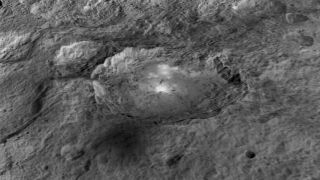 Ceres' more familiar — but perhaps even more mysterious — bright spots reside inside Occator, a 60-mile-wide (97 km) crater. Occator only recently received an official name, but scientists have been speculating on the bright spots' nature and origin since they were first glimpsed in January as Dawn approached the dwarf planet. Dawn's measurements of the spots — which appear to be subliming gas to create a mini-atmosphere within the crater — are so far not consistent with the properties of water ice, researchers said. "The science team is continuing to evaluate the data and discuss theories about these bright spots at Occator," Dawn principal investigator Chris Russell, of UCLA, said in the statement. "We are now comparing the spots with the reflective properties of salt, but we are still puzzled by their source. We look forward to new, higher-resolution data from the mission's next orbital phase." The new animation has vertical relief exaggerated by a factor of five to make it easier to examine the strange topographies and notice subtle changes, NASA officials said. By examining such an animation, scientists can get a better idea of how particular features of interest fit into the overall structure of the dwarf planet. This image of the dwarf planet Ceres, taken by NASA's Dawn spacecraft, features a large, steep-sided mountain and several intriguing bright spots. The $466 million Dawn mission launched in September 2007 to study Ceres and Vesta, the two largest objects in the asteroid belt. The probe orbited Vesta from July 2011 through September 2012, and it arrived in orbit around the 584-mile-wide (940 km) Ceres this past March. "There are many other features that we are interested in studying further," Dawn science team member David O'Brien, senior scientist at the Planetary Science Institute in Arizona, said in the statement. "These include a pair of large impact basins called Urvara and Yalode in the southern hemisphere, which have numerous cracks extending away from them, and the large impact basin Kerwan, whose center is just south of the equator."